August 6, 2013: Homeless Bills of Rights are spreading throughout the country with Illinois and Connecticut becoming the second and third states to pass legislation. Read more in our press release. July 26, 2013: Is your state legislator considering a Homeless Bill of Rights? Show your support and be heard by sending a letter to your State Representative or Senator. Click here to take action! June 21, 2013: The Board of Directors of the National Coalition for the Homeless announces Jerry Jones as its new Executive Director! Read the full announcement and learn more about Jerry here. June 5, 2013: Connecticut passes Homeless Person's Bill of Rights! Congratulations to all the advocates and activists who helped achieve this victory. Read more from ThinkProgress. May 22, 2013: NCH goes to The Hill! Read our report from the Congressional briefing, "Homelessness in America: Experiences & Solutions in the 113th Congress". May 3, 2013: This weekend, Fine Line Services CEO, Eric Weires, will take NCH's Corporate Homeless Challenge. Learn more about the Challenge and follow Eric's journey. April 25, 2013: Registration is now open for the 25th Annual National Association for the Education of Homeless Children and Youth (NAEHCY) Conference. Join program coordinators, educators, service providers, and other colleagues in Atlanta, Georgia on November 2-5, 2013 to learn best practices for educating homeless children and youth. March 26, 2013: The Board of Directors of the National Coalition for the Homeless announced today that it is seeking a dynamic, motivated, and innovative Executive Director to maintain and enhance the Coalition’s role as a national leader in working to prevent and end homelessness. February 12, 2013: NCH Executive Director, Neil Donovan, defends one-to-one giving on WBUR 90.9 FM's Here & Now segment "Is Change in a Cup the Best Way to Help the Homeless?" December 21, 2012: Join us in remembering our friends and neighbors who have passed away while without a home. Find an event in your city or learn more about the 23rd Annual Homeless Persons' Memorial Day and how you can participate. November 27, 2012: In honor of #GivingTuesday NCH Member and Author, Jay Levy, has pledged to donate 100% of the proceeds from his books that reflect on homeless issues from November 27, 2012 - December 31, 2012. November 10 - 18, 2012: National Hunger and Homeless Awareness Week is upon us! Thousands of you will be taking part in changing the way we view homelessness. If you are not organizing an event, click here to find one in your area, or to read more about how you can be involved. November 9, 2012: Today the Department of Housing and Urban Development (HUD) released its Notice of Funding Availability (NOFA) for the Continuum of Care (CoC) Program competition. CoC Collaborative Applicants and Project Applicants may now submit applications for funding in e-snaps. The competition will close at 7:59:59 p.m. EST on Friday, January 18, 2013. September 30 -October 6, 2012, is National Homeless and Low-Income Voter Registration Week. NCH member across the country to hold registration drives, candidate or and voter education forums. July 31, 2012: Interim CoC Regulations for HEARTH Published in Federal Register. The Homeless Emergency Assistance and Rapid Transition to Housing Act of 2009 (HEARTH), consolidates three of the separate homeless assistance programs administered by HUD under the McKinney-Vento Homeless Assistance Act into a single grant program 1) Supportive Housing program, 2) Shelter Plus Care and 3) Moderate Rehabilitation/Single Room Occupancy, and revises the Emergency Shelter Grants program and renames it the Emergency Solutions Grants program. The HEARTH Act codifies in law the Continuum of Care planning process, a longstanding part of HUD's application process to assist homeless persons by providing greater coordination in responding to their needs. The HEARTH Act also directs HUD to disseminate regulations for these new programs and processes. See the Federal Register for more. July 25, 2012: Come listen to 4 members of our Speaker's Bureau share their stories at our event Can You Hear Us? at 6pm on 23rd and P.
July 16, 2012: NCH announces a new campaign to encourage meaningful participation in the fight to end homelessness. Find out more about why Membership Matters. July 16, 2012: HUD to Publish New CoC Interim Regulations Under HEARTH. Read More. July 6, 2012: Food sharing bans across the country are making it more difficult for people to receive and share food. Check out NCH's response in NPR news. June 28, 2012: Today, the Supreme Court ruled on the Affordable Care Act. Read NCH's response to the decision. June 1, 2012: Check out NCH Staff talking about what home means to them on the Speak For We Blog. May 30-31, 2012: Join Horizons for Homeless Children for their 7th Annual Young Children Without Homes Conference in Boston, MA. May 9, 2012: Online Event: Health Reform & Homeless Populations: What Does the Law Do for You? Join the Health Care for the Homeless Council's Consumer Advisory Board for this training on how health care reform affects people experiencing homelessness. April 20-22, 2012: Global Youth Service Day, chaired by First Lady, Michelle Obama, helps engage young people and celebrate youth leadership in all 50 U.S. states and in over 100 countries around the world. Check out the map of events happening around the world, or read more about how you can get involved! March 12, 2012: March 10-18th is AmeriCorps Week! We send a big Thank You to the hundreds of volunteers that have increased the impact of NCH's mission over the years! Learn more about our current VISTA project. February 17, 2012: NCH announces a new campaign, Crisis Hidden in Plain View, to encourage outreach and engagement to families and individuals who are homeless or at-risk of becoming un-housed. Learn more or watch the video. January 25, 2012: ACTION ALERT: Help protect the privacy rights of those using Homeless Management Information Systems (HMIS). Comments due on proposed regulations by February 7, 2012. January 11, 2012: Three un-housed men have been killed recently in Orange County, CA. With the possibility that these deaths were caused by a serial killer, NCH has released a new report: Hate Crimes Against the Homeless: Violence Hidden in Plain View. This report is the result of annually tracking bias motivated crimes committed against un-housed individuals. It is also a report that, in it entirety, illustrates the deadly consequences of decades of failed housing policies and social reforms. December 21, 2011: Its time again to remembers our friends and neighbors who have passed away while without a home. Learn more about the 22nd Annual Homeless Persons' Memorial Day, and join us for our event in Washington, DC. December 6, 2011: The US Dept. of Housing and Urban Development (HUD) has issued the Final Rule on their definition of “homeless” and an Interim Rule on the Emergency Solutions Grant. The effective date of both rules will be January 4, 2012. The deadline for public comment on the ESG interim rule is Feb. 3, 2012. NCH encourages you to disseminate this information widely and take advantage of the opportunity for public comment. November 12-20, 2011: National Hunger and Homeless Awareness Week is upon us! Thousands of you will be taking part in changing the way we view homelessness. If you are not organizing an event, click here to find one in your area, or to read more about how you can be involved! November 9, 2011: Today only, NCH is partnering with Razoo.com to raise funds for National Hunger and Homelessness Awareness Week; Donate Now, and End Homelessness in One Day! November 7, 2011: As National Hunger and Homelessness Awareness Week approaches, NCH has released a new factsheet: Hunger and Food Insecurity. October 13-16, 2011: Register today for the 2011 North American Street Newspaper Association Conference, to be held in Nashville, Tennessee. October 7, 2011: NCH is partnering with VOLCOM Jeans throughout the month of October for Give Jeans a Chance, an international campaign to bring attention to the issue of homelessness. During the month of October, when you drop off a pair of jeans or a coat at a store, you can be entered to win a trip for 2 to come out to Volcom HQ in California to be a part of the GJAC donation event in November, plus you could win up to $500 in Volcom gear. August 24, 2011: States have been enacting increasingly restrictive voter requirements that affect voters who are homeless or low-income and have difficulty in proving a permanent address or in obtaining proper identification. Neil Donovan has sent a letter to the U.S. Attorney General expressing NCH's concerns. You can TAKE ACTION today by sending your letter of support. Learn more. August 18, 2011: Gainesville City Commissioners vote unanimously to repeal the city's 130-person feeding limit ordinance. Read more. July 21, 2011: We are proud to be able to make the Faces of Homelessness videos freely available on YouTube. Check out these, and our other videos on the NCH YouTube channel. July 19, 2011: NCH Speaker Alan Banks is profiled in an article from Washington, DC station WTOP: "'Homelessness Doesn't Care': A Life on the Streets." July 4, 2011: NPR's Pam Fessler reports on the Faces of Homelessness Speakers' Bureau as "Ex-Homeless Speak out to Change Perceptions." July 13-15: National Conference on Ending Homelessness, hosted by the National Alliance to End Homelessness will be held at the Renaissance Washington DC Hotel. June 23-25: The National Health Care for the Homeless Council is holding their annual National Conference in Washington, DC. Learn more about the event. June 20, 2011: NCH has studied the 2010 Annual Homeless Assessment Report to Congress, and announces the release of a summary of the report's key findings and statistics. June 10-12: For the 4th year in a row, Street Soccer USA (SSUSA) will be holding the annual Street Soccer USA Cup 2011 at the Washington Kastles Stadium on the Wharf. Click here to find out more information. June 7-8: The National Law Center on Homelessness and Poverty is hosting the National Forum on the Human Right to Housing in Washington, DC. Registration is open now, sign up to attend today! June 3: NCH announces the release of recommendations on areas we consider priorities for consideration by the U.S. Department of Housing and Urban Development (HUD) as it develops its proposed regulations for the Homeless Emergency Assistance and Rapid Transition to Housing (HEARTH) Act. June 2: The National Law Center on Homelessness & Poverty has released a report card grading the United States on its response to homelessness and its compliance with the human right to housing. "Simply Unacceptable" : Homelessness and the Human Right to Housing in the U.S.
April 20: The Colorado State Senate has approved SB4, a bill that would add homeless persons to the state hate crimes law. The bill is now waiting for a vote in the House. NCH is proud of the great work of the Colorado Coalition for the Homeless! April 15 & 18: NCH joins with the Universal Living Wage Campaign in support of nation-wide standouts today. Learn more! See a picture NCH Staff. March 6: Watch the new show that's been featured on Oprah, Secret Millionaire, this Sunday on ABC. February 23: Listen to the Homelessness Marathon starting at 5pm EST. The Homeless Marathon is an annual 14-hour radio broadcast featuring the voices and stories of homeless people from around the United States. More can be found at FreeSpeech.org and the Homeless Marathon website. February 14, 2011: President Obama has just released his 2011 Budget, which includes drastic cuts to safety net services and anti-poverty programs. Learn more about the proposed cuts and what you can do! February 23: Join the SAMHSA ADS Center for a free teleconference, Housing, Homelessness, and Social Inclusion: Essential Elements of Healthy Communities. Register here by February 20th to attend. February 3: TAKE ACTION - Tell Congress not to cut funding for housing and community development programs. Join local actions on Valentine's Day. January 19: Homeless Challenge graduate and college student Pete Danelski describes his "Lessons Learned in Becoming Invisible" in Street Sense street newspaper. January 3, 2011: NCH mourns the passing of Speaker Cliff Carle. December 23: We at NCH want to wish all of our homeless neighbors, fellow advocates, donors, members and supporters the best of what the holiday season can offer. Our wish is for the opportunity to keep fighting for more affordable housing, greater access to affordable healthcare, more livable wages, and an end to homelessness. Join us in 2011 and let us know what ending homelessness and supporting NCH means to you. December 22: Text to Give this holiday season! Text NCH to 85944 and reply YES to make a $10 donation. December 21: NCH is hosting National Homeless Persons' Memorial Day. Read the manual for more information about how you can participate. November 16: Support NCH and your local NBA team - buy your tickets here for the Washington Wizards vs. Toronto Raptors game in DC. November 14-20: National Hunger & Homelessness Awareness Week is coming up! Be sure to plan your events and see the manual for more information. November 12: Sacramento Steps Forward has just released their 2010 Homeless Employment Report. Read more about Economic Justice. October 1: Great opportunity for homeless (and formerly homeless) high school students to get college scholarships. The deadline to apply online is October 30, 2010. For more information visit the Give US Your Poor website. September 30: Look for Universal Living Wage Campaign Chairman Richard Troxell's new book Looking Up at the Bottom Line: The Struggle for the Living Wage in your favorite bookstore or online. September 29: The United States Senate Judiciary Subcommittee on Crime and Drugs has scheduled an historic hearing entitled “Crimes Against America’s Homeless: Is the Violence Growing?” for Wednesday, September 29, 2010 at 10:00 a.m. Read more here. September 26- October 2: NCH will again sponsor National Homeless and Low-Income Voter Registration Week. Click HERE to find out more. September 24: We're currently hiring for the position, "Director of Education and Training." To learn more, read the position description. August 19: NCH's 2009 Hate Crimes report is featured in today's New York Times. Read the article HERE. August 19: Brian Levin from California State University discusses NCH's Hate Crimes Report on the Huffington Post. August 19: 2009 was one of the deadliest years for people experiencing homelessness. Find out more in NCH's 2009 Hate Crimes report, Hate Crimes Against the Homeless: America's Growing Tide of Violence. July 21: July 2010 marks the 20th anniversary of the passing of tireless homeless advocate Mitch Snyder. Current and former staff remember and honor the legacy he left behind. Read more here. July 20: Another report by the US Government Accounting Office (GAO) released today finds that comparing the extent of homelessness in rural and non-rural areas is difficult primarily due to data limitations. Download the free report here: Rural Homelessness: Better Collaboration by HHS and HUD Could Improve Delivery of Services in Rural Areas. July 11: The US Government Accounting Office has released a new report on the differing definitions of homelessness held by Federal agencies. Download the free report here: HOMELESSNESS: A Common Vocabulary Could Help Agencies Collaborate and Collect More Consistent Data. July 11: Rapid Rehousing: a manual for providers has been updated and is available for free download. July 6: Read NCH’s comments on the recently released Federal Strategic Plan to Prevent and End Homelessness. June 16: USHUD releases annual assessment report to Congress (AHAR). AHAR is delivered at a critical moment - as the federal government continues to shift its focus toward preventing homelessness and on the even of the first-ever federal plan to end homelessness. The full AHAR report will be available at the HUD Homelessness Resource Exchange. June 15: USICH is excited to announce the release of the nation’s first comprehensive strategy to prevent and end homelessness titled Opening Doors: The Federal Strategic Plan to Prevent and End Homelessness on Tuesday, June 22, with a ceremony hosted by President Obama. The full report will be available at www.usich.gov. June 15: NCH has submitted comments to the U.S. Department of Housing and Urban Development (HUD) on its proposed rule (Docket No. FR-5333-P-01) to explain or elaborate the terms “homeless,” “homeless individual,” “homeless person,” and “homeless individual with a disability” as defined in the Homeless Emergency Assistance and Rapid Transition to Housing (HEARTH) Act. Read the recommendations here. May 11: Governor Crist signs Florida Hate Crimes Law. April 21: Success in the House! Urge the Florida Senate to do the right thing by passing the Hate Crime Protection for Homeless People Bill (SB 506). Protect our most vulnerable friends and neighbors by signing our online petition. April 21: State by state factsheets detailing acts of violence committed against homeless people can be found here. April 19: HUD releases draft regulations on the HEARTH Act's definition of homelessness. April 15: U.S. Census Bureau Fails to Count America's Homeless. April 11: Text HOME to 85944 and reply Yes to confirm your $10 donation to NCH! March 12: The Department of Veterans Affairs' (VA) has founded a National Call Center for Homeless Veterans hotline to ensure that homeless Veterans or Veterans at-risk for homelessness have free, 24/7 access to trained counselors. The hotline is intended to assist homeless Veterans and their families, VA Medical Centers, federal, state and local partners, community agencies, service providers and others in the community. To be connected with a trained VA staff member call 1-877-4AID VET (877-424-3838). Or visit http://www1.va.gov/HOMELESS/NationalCallCenter.asp for more information. March 5: NCH released a new report, Tent Cities in America Pacific Coast Report. March 1: The Office of Intergovernmental Affair's Homeless Veterans Program is seeking nominations for the Secretary's Award for Outstanding Achievement in Service for Homeless Veterans. Nominations are due by April 17th, click here to access the nominations forms: http://www.nchv.org/news_article.cfm?id=685. GreatNonprofits is also recognizing organizations doing great work with veterans experiencing homelessness, go to http://greatnonprofits.org/veterans by March 31st for more information. Demands Ending Homelessness for All. President Obama is on record as being “personally committed to ending homelessness among veterans within the next five years.” His new campaign of “Zero Tolerance for Homeless Veterans” can only be achieved through the difficult and honorable path of ending all homelessness in America. December 22: The National Coalition for the Homeless has issued a position statement on homeless data collection and reporting. The position statement is intended to guide the Coalition’s public policy positions on federal homeless data collection and reporting matters, including policy decisions regarding the Homeless Management Information System (HMIS) and the Annual Homeless Assistance Report. December 9: Join us for our year end Quarterly Public Policy Call on December 9 at 4pm est. All are welcome to join. November 22: ACT NOW to protect people experiencing homelessness from hate-motivated violence. October 21: The National Coalition for the Homeless congratulates Barbara Poppe on her appointment as the new Executive Director of the United States Interagency Council on Homelessness (USICH). October 19: The NY Times front page article for Monday October 19 explores the all too common need for foreclosure victims to check in to homeless shelters; referencing NCH's Foreclosure to Homelessness 2009 report. September 25: Are you confused by the new Homeless Prevention and Rapid Re-Housing Regulations? NCH Board Members Sue Watlov Phillips (Elim Transitional Housing, MN) and Sherri Downing (Montana Council on Homelessness) have drafted a Rapid Re-Housing Manual that is available for download at http://www.elimtransitionalhousing.org. August 29: Take a Stand to 'Bridge' the Minimum Wage Gap on September 8th. August 26: Government Stops Unlawful Social Security Suspensions; Agrees to Repay More Than Half a Billion in Back Benefits. August 7: New Report Documents 10 Years of Anti-Homeless Violence. 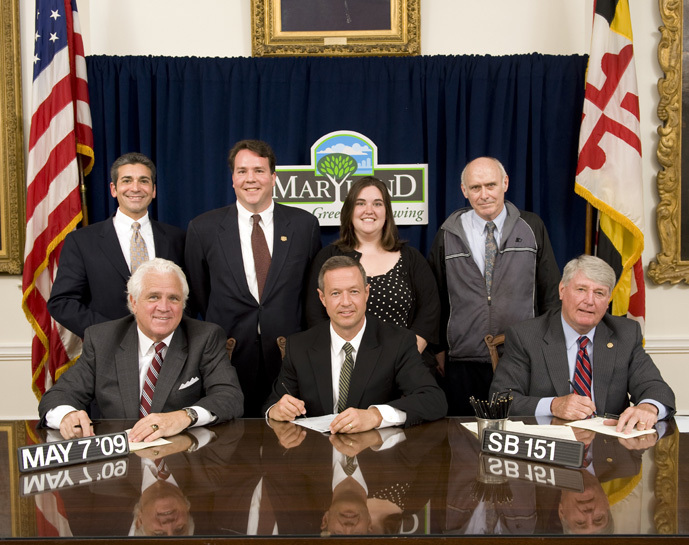 May 13: View a photo from the historical Maryland protected class bill signing. May 7: Maryland to Become First State to Add Homelessness as Protected Class to Hate Crimes Law.